Now that you've got your Finance Now Card, all you need to do is activate it. NOTE: Your Card limit will be reassessed at the time of Card activation and will be based on your updated credit position. Your Card limit will be provided in your Disclosure Statement. Please ensure you keep a copy for your records. Your Finance Now Card is an acceptable form of ID at any of our Finance Now retailers. Simply present your card for fast verification and processing via your mobile. Don’t have money on you? Don’t worry, use your Finance Now Card at any EFTPOS terminal throughout NZ and buy anything from chewing gum through to a whole new wardrobe. Need money just in case? Your Finance Now Card is accepted at all ATMs throughout NZ, so you’ll always have money at your fingertips. By clicking the Activate button you accept our full Terms and Conditions and Disclosure Statement. Please read so you understand your rights and obligations. *Terms and Conditions apply. Finance Now's normal lending criteria and loan terms apply. Interest rates from 19.95% p.a. apply. A $0.25 transaction fee applies to purchases less than $20. A 6 monthly fee of $19.95 applies on the first purchase transaction and is included in your first statement. Your Card limit will be reassessed at the time of Card activation and will be based on your updated credit position. Want to speak with someone? 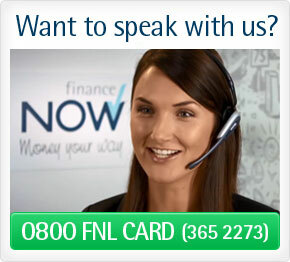 call us free on 0800 FNL CARD (365 2273).